National Railways of Zimbabwe trains (file photo). 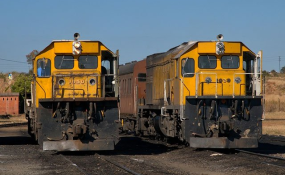 Struggling rail transporter, National Railways of Zimbabwe (NRZ) is reportedly failing to deliver 179 wagons of wheat currently stuck at Mozambique's Beira Port, a situation feared could force bakers to further raise bread prices due to flour shortages. The NRZ pledged to transport 50 wagons of wheat per day from 16 September this year but has only managed to bring in 58 in total, according to Grain Millers Association of Zimbabwe (GMAZ) general manager Lynette Veremu. GMAZ recently procured 30,000 metric tonnes of the cereal. In a letter sent to Transport Minister Jorum Gumbo recently, Veremu stressed the need for government to speedily transport the much needed product so as to ease current flour shortages. "The GMAZ procured 30,000 metric tonnes of wheat to ameliorate the current bread shortages; the wheat is scheduled to be shipped into the hinterland by rail as usual. "In order to immediately commence to stabilise the bread supply, we requested and NRZ committed to bring in at least 50 wagons a day into Harare. "Regrettably, only 58 wagons have arrived in Harare since 16 September 2018; we understand that currently 179 wagons are laden with the imported wheat and stuck in Beira whilst the bread supply here remains critical," said Veremu. Zimbabwe needs about $12,5 million per month for wheat imports which translates to some 1,9 million loaves per day. NRZ public relations officer Arnold Mutema directed all questions to spokesperson Nyasha Maravanyika who professed ignorance on developments within the organisation saying he had been in Bulawayo and did not know anything yet on the issue. "I am coming from Bulawayo and do not know anything. I have to first check with those who have been on the ground and get back to you because I do not have that information," said Maravanyika. Confederation of Zimbabwe Retailers president Denford Mutashu last week warned of a decline in supply of bread if the imported wheat is not made available sooner rather than later. The situation has been followed by bread production declines from the monthly requirement of 38,000 metric tonnes to less than 28,000 metric tonnes. The central recently released $12,450,000 to Holbud Limited of the United Kingdom which is owed over $20 million for maize and fertiliser supplies dating back to 2016. Bread prices have risen in the informal sector from the price of $1.10 to $1.30.